igus has enlarged its three-dimensional energy chain system Triflex R about the variant TRLF.100 (F = Flip open). 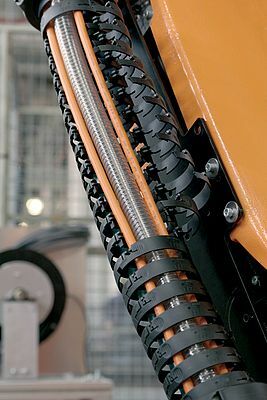 Each chain link has three pivoting crossbars that can be opened any time. This clearly facilitates filling with large cable diameters or cable packages. With the new variant with an inner height of 38 mm and a bending radius of 145 mm, filling or exchange of cables will be easier, because the individual chain links can be opened by hand or with a screwdriver thanks to a clever snap mechanism. This allows thick or inflexible hoses with large filling diameters or a high number of single cables to be inserted in a record time. The new energy supply can be lengthened or shortened as desired due to its modular design. A torsion of +/- 10° per chain link in its longitudinal axis enables defined torsional movements. This supports safe guiding of hoses and cables even around difficult geometries. The new energy chain is made for simple robot applications or other 3D movements without disturbing edges where the energy chain could stick. Furthermore cable guiding systems are imaginable for the entire field of mechanical engineering.